Usually a popular option during the National, the silver packs will be flying at the Panini booth thanks to the 2018 Panini National Convention Wrapper Redemption promo. The NSCC packs are distributed at the multi-day National Sports Collectors Convention in Cleveland in exchange for buying sealed wax at the show. More details for the National are available in our full NSCC guide. Panini also has a separate NSCC set for VIP ticket-holders and exclusive gold foil packs for those that attend the Panini VIP Party. 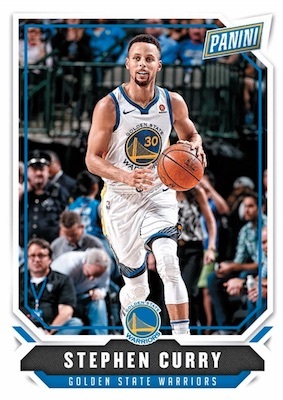 Working with a sizable base lineup, at least for a promo, the multi-sport 2018 Panini National Convention Wrapper Redemption checklist features a main design and several themed subsets. Collectors can find the stars of pro baseball, basketball, football, soccer and racing. 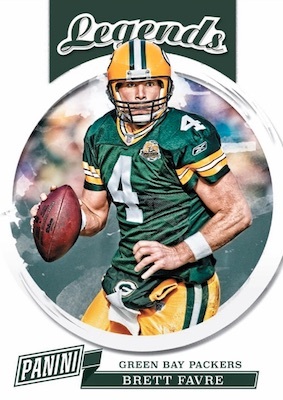 Although the base design is quite simple, the Legends subset has a little more style for the all-time greats. 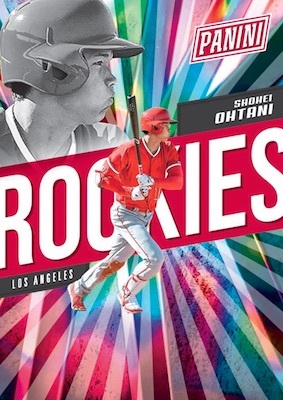 In addition, the Prospects set is for the incoming NBA talent, while Rookies covers first-year stars from the NBA, NFL, MLB and NASCAR using a much more eye-catching design. True to form, several parallels are expected. Hits include autograph and memorabilia editions for many of the subjects. There are also exclusive Pink Prizm parallel editions from earlier sets found only in these packs. If you are wondering how to acquire the 2018 Panini National Convention Wrapper Redemption cards, the easiest route is to be in Cleveland at the start of August. Of course, they will show up on eBay soon after. Collectors at NSCC 2018 earn the packs by making designated Panini Hobby box purchases from certain retailer booths at the show. Specifically, the official dealers include Atlanta Sports Cards, Blowout Cards, Dave & Adam's Card World and Steel City Collectibles. 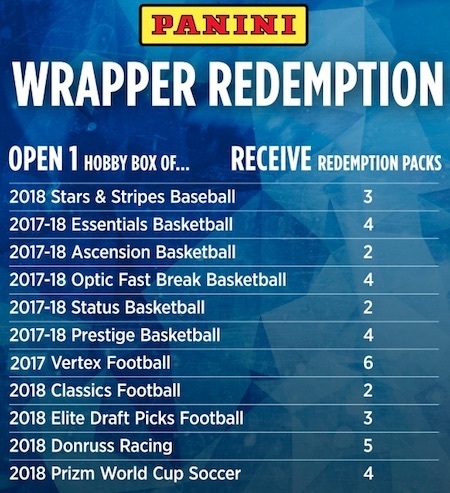 The 2018 Panini National Convention Wrapper Redemption promo only applies to certain Panini sets, with each offering a number of silver foil packs, ranging from two to six, per box. PARALLEL CARDS: #/99, #/49, #/25, #/10, 1/1. Features exclusive Pink versions from previous Panini sets. 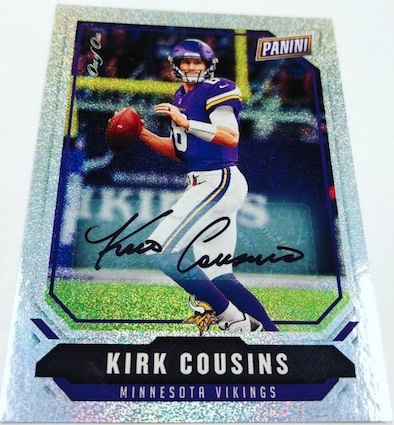 Panini added Printing plates in this year’s silver packs. No idea why or how SP these will be.